This is the e lab for ‘collaboratElaborate’ an online experimental art project taking place – here – in July 2011. Subscribe to receive daily posts from 10 emerging writers, artists, photographers & visual folk posting art every day for 31 days, from 3 different countries, to produce 310 (micro) cross-border art projects. An online E Lab is a both vacuum and a creative chamber; a manifestation of 10 minds staring at a screen; a way to get each of us producing (in the heat of the northern summer, in the dark, short days of the southern winter) for one month; a gate to each other’s work and a hinge to see what responses flow through; an opportunity to show anyone and everyone an artwork in process, developing, organic, pesticide-free; a way to do it all for free. Click on the ‘we’ page to find out who is collaborating. Please note: All rights for artists’ content (including copyright, reproduction and printing rights) remain with the individual artist. Images and text posted on CollaboratElaborate may not be reproduced without the permission of the individual artist. All rights for the CollaboratElaborate site content excluding artists’ postings rest with Collaborate2011. 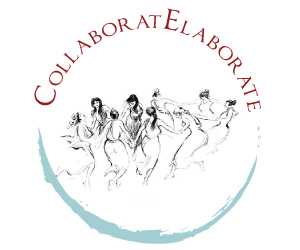 CollaboratElaborate is sponsored in part by the Arts Initiative at Columbia University. This funding is made possible through a generous gift from The Gatsby Charitable Foundation.